Learn about opposites with Dr. Seuss! This is a very fun book app and a nice addition to any educational library. It is one of the best digital options to teach about opposites and among the Seuss books aimed at young readers. Engaging in a way only Dr. Seuss can be, this book demonstrates through whimsical illustrations concepts like dry/wet, slow/fast, big/small and even his/her. 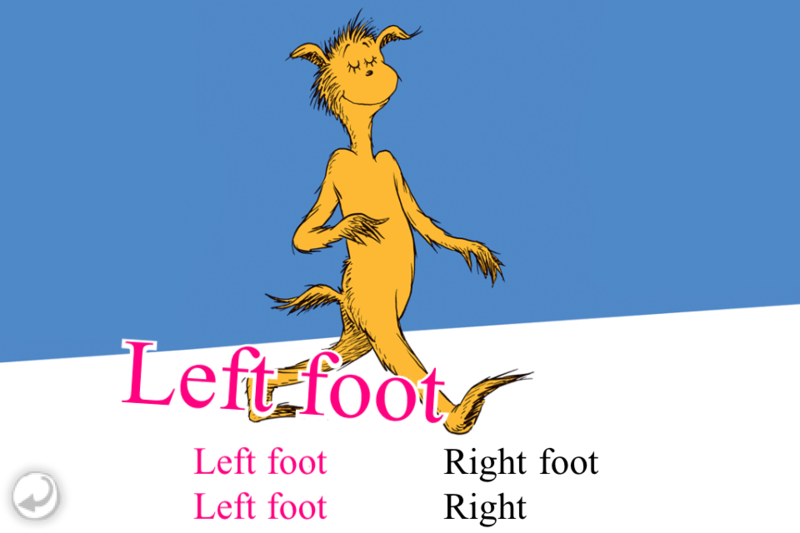 The story follows a Seussical looking character who is exploring all the kinds of feet, starting with left and right. In print, this book has been a favorite of kids and their parents since it's publication in 1968. This one stands out for its emphasis on opposites and is among the Seuss books that stick to sight words for the benefit of 'learner readers'. Like the other titles from Oceanhouse Media, this book also has an eye on educational enhancements. For the read-a-long effect, each word is highlighted as it is read. Tap on any word to hear it spoken, even in the 'read-it-myself' mode. These book apps also have ample settings, with the absence of only one thing I would suggest - a page guide. For interactivity, most of the items pictured in the story react to a light tap with a visual image of the word with accompanying audio (for example, tap on the feet on most pages and the word "feet" appears with audio saying “feet”. If the image tapped is also represented in the text on that page, the word(s) will highlight as well. In digital form, Seuss book apps are often even more fun than in print and this one is no exception. This title is also one of the shorter Seuss books, making it a nice bedtime read. A must for any digital Seuss collection for young readers! "The Foot Book: Dr. Seuss's Wacky Book of Opposites (ISBN 0-394-80937-8) is a children's book written by Dr. Seuss and first published in 1968. The Foot Book is intended for young children, and it seeks to convey the concept of opposites through depictions of different kinds of feet. The text of The Foot Book is highly stylized, containing the rhymes, repetitions, and cadences typical of Dr. Seuss's work. Reading this book will teach the reader that you should not judge any one because of what they look like or in this case their feet. The Foot Book is Seuss's first in the Bright and Early Books series, intended for children too young for books in the Beginner Books series. It was also his first book after the death of his wife Helen Palmer Geisel, and Seuss put in eight-hour days working on it as a way of coping with his loss. The Foot Book was extremely successful, and as of 1997, it was in its 52nd reprinting."